Come and join us on an artist led walk in the woods as part of our ‘Lets Create’ funded project “Walking with the Saints’’. The North East is famous for its Christian Saints. Lindisfarne has been a place of Pilgrimage for centuries: The Lindisfarne gospels, the lives of St Cuthbert and Saint Bede and the founding of Durham Cathedral has resulted in this region being recognized in many people’s eyes as the cradle of Christianity. In this project we want to explore the meaning of Pilgrimage: the Diocese of Durham has named 2020 as “The Year of Pilgrimage” But this leads us to ask; what in this secular age is a Pilgrimage and how does it relate to the lives of ordinary people? Our aim is to promote a sense of emotional and spiritual well-being as we journey together in a safe environment connecting with the landscape and sharing our new stories. The project seeks to bridge the gap between our regions iconic stories of the Northern saints and our own personal stories and the things that give our lives “meaning”. On the walk we will create land art, theatre, songs, photographs, creative stories and digital art works with all the family, getting inspiration from the landscape, one another and ourselves. Suitable for 5 year old and upwards. Please note that the walk is not suitable for pushchairs. Please wear warm clothes and appropriate footwear. 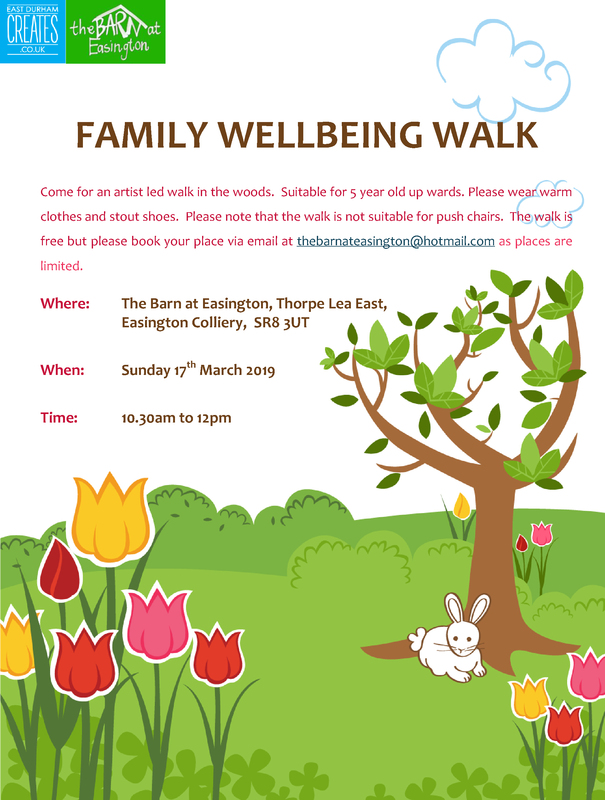 The walk is free but please book your place via email at thebarnateasington@hotmail.com as places are limited.